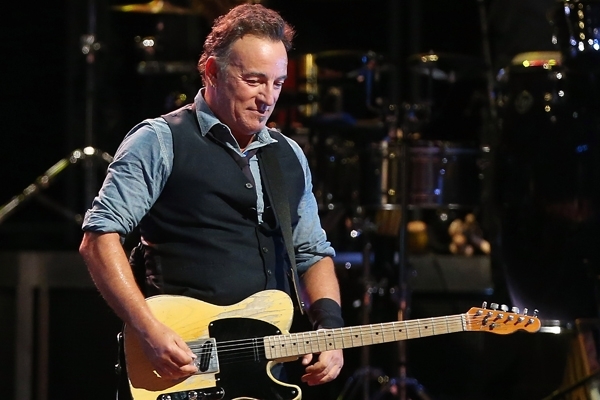 Bruce Springsteen performed the entire Born to Run album in England last night in tribute to James Gandolfini, the Sopranos star who died Wednesday of a heart attack while vacationing in Italy. Hidden Track reports that after performing "The River" 11 songs into the set in Ricoh Arena in Coventry, Springsteen stopped and announced that he and the E Street Band – including guitarist Steven Van Zandt, Gandolfini's Sopranos colleague – would play all of the 1975 LP for Gandolfini, whom Springsteen called "our great friend." The full-album performance came in the middle of a 30-song set that also included Springsteen classics like "Badlands," "Hungry Heart" and "Born in the U.S.A.," along with covers of Jimmy Cliff's "Trapped" and Eddie Floyd's "Raise Your Hand." Gandolfini's death at 51 prompted an outpouring of grief from friends and fans, including Van Zandt, who tweeted, "I have lost a brother and a best friend. The world has lost one of the greatest actors of all time."